The Rivet Nut is designed with four holes present around its shank or body to enable a controlled deformation (bulge) of the body when subject to a compressive load. This charateristic enables the use of these rivet nuts in critical applications and softer materials where they would otherwise not be suitable. Tappex Rivet Nuts (MultiRiv®) include four holes in the deformable shank or body of the Rivet Nut. As the Rivet Nut is installed the location of the holes determines where the bulge will start and how it develops. This feature enables the use of MultiRiv® where a traditional rivet nut would not be suitable as they typically require higher compressive load and the relative position of deformation is not accurate. Tappex MutiRiv® are very suitable a wide range of Plastics (sheet form) , Composites (including GRP & Carbon-fibre) , Woods, and where it is necessary to generally install into oversize or irregularly-shaped pre-machined holes. Reduced stress in the parent material. Larger deformed diameter for a given size. Its properties are beneficial in materials that are prone to stress cracking where the pressures generated by the bulge of a traditional rivet nut could fail the material. 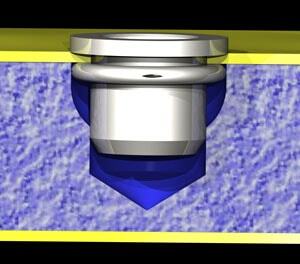 Similarly in applications that require the rivet nut close to an edge the reduced stress induced can prevent the formation of cracks in the thin wall. More and more applications utilise the benefits of reduced weight and high rigidity for low cost that may be found using sandwich structured composite materials. These materials present the designer with some problems in relation to attaching / assembling parts securely whilst allowing disassembly / servicing. In the past it has been necessary to include materials and features in the manufacture of the sandwich material to enable standard fasteners to be used. 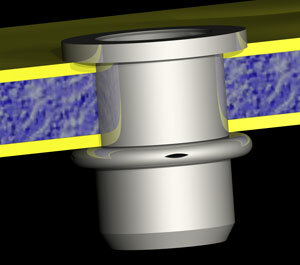 The rivet nut offers an alternative where, depending on the material configuration, thickness and requirements, the rivet nut can either bridge the entire thickness of the sandwich material or be attached securely to one skin while retaining the continuity of the other skin that could be an A surface. Hand tools and Pneumatic equipment are available for installing the MultiRiv® / rivet nut please ask for information.